Marc Jacobs Crosby Sutton bag. If you're a regular reader of The Marcy Stop, you're no doubt familiar with our format: Micol shoots all the photos, I pose for them in whatever outfit we're showcasing, and we both take turns writing about whatever crosses our mind. Well this week you're in for a treat! Guest blogging for 80%20 gave us the perfect opportunity to switch things up and put Micol in front of the lens so our readers could get a rare glimpse into her personal style and fashion-forward aesthetic. I mean, there's a reason why I love raiding her closet, people! Check out our Instagram pics above to see how she styled 80%20’s Edie loafer for two completely different, but equally awesome, looks. And don't forget to click through here for more photos of her rocking each ensemble. Heeeey Micol! Man, I can't decide which ensemble I like best. 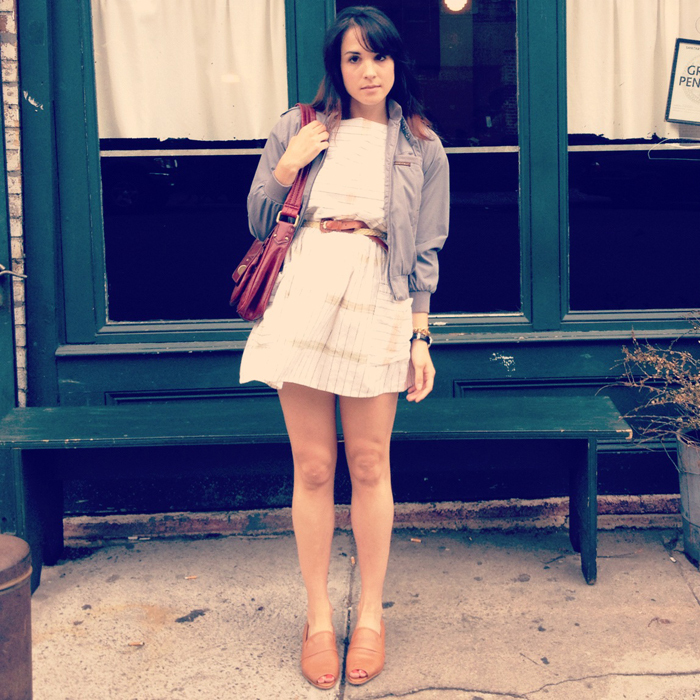 While I do love an adorable working woman outfit, especially when it involves that super cute top Peter Pan collar top, I am truly a sucker for baby doll dresses! Cool! Micol, finally got to see the girl behind the camera in an outfit post you look lovely! Love the switch up. :) I love love love that white blazer! And of course the Marc Jacobs bag. I like how the shoes can transition between two different looks. I'm a big fan of transitional pieces. You look great! I love look #1!! For I minute I thought that I opened the wrong blog...Wow, it's Micol! :) Both looks are gorgeous, but I'm choosing outfit #1. I love the blazer in the first pic. It's so cool! And outfit is so lovely! Thanks so much for leaving such a lovely comment on my blog. I love that first look. So stylish. I'll be popping back again soon. It's nice to see Micol's style for a change... and I love it too! 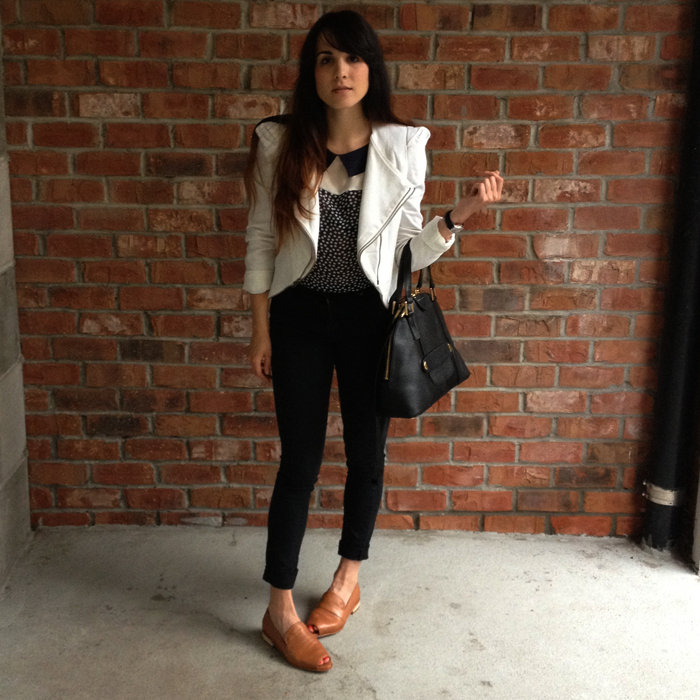 the shoulder pads on that white blazer is awesome!!!!! You're gorgeous, love your outfits! I am in love with your polka dot top. Super cute. Love the switch up! Fantastic! Both of you have such great style ;) I would raid both of your closets! OH wow, she looks amazing!! LOVE the loafers! You ladies are too cute. PS Super into your blog, definitely following! I would LOVE if you'd take a look at mine, lemme know what you think, follow back if the spirit moves you! Great outfits. I adore those shoes. love the strong shoulders! heyyy Micol, looking good girl! I love the first outfit, the jacket is so pretty! I love both outfits, specially the second one! Ooooh love both looks, but especially the top in the first one! love this looks and also your blog! It's so nice!!! I follow you! Fun! Love the switchup! Obsessed with both looks!